The Southern Arizona Travel Guide is a resource for those planning a road trip or vacation to the region. The southern half of Arizona, including the metropolitan Phoenix and Tucson areas, is within the Sonoran Desert. This section covers the high range country of Southeastern Arizona, which offers slightly cooler summers than the desert. The most notable attraction is the historic western town of Tombstone with the famous copper mining town of Bisbee nearby. Reminders of the Apache wars can be seen at Fort Bowie. Many visitors walk across the border at Nogales, Arizona to sample the adjacent town of Nogales, Mexico. Arizona's fledging wine industry is centered around the villages of Elgin and Sonoita. Southeast Arizona also features one of Arizona's great new attractions, Kartchner Caverns, perhaps the most pristine limestone caverns in America accessible by the public. This guide offers descriptions of many points of interest, links to many references, travel itineraries, and suggested visit times. See below for Southeastern Arizona Points of Interest and the complete Index for this guide. Tombstone, Arizona, is the most historic town of the Old West, where Wyatt Earp and the Gunfight at the O.K. Corral became the west's most famous legend. Visitors can stand at the exact site where the gunfight took place. Many of the Tombstone's original landmarks had fallen into disrepair or ruin, and have been rebuilt or restored. The main street's storefronts and boardwalks recreate an 1881 feeling. Gunfight re-enactments take place during the day. The Boothill Graveyard has been restored, with the grave markers still maintaining their original colorful epitaphs of yesteryear. The Tombstone Court House has been restored to its 1903 version. Be sure to check out the gallows in the courtyard. One of the best attractions is the amazing Bird Cage Theater which is entirely original, as are all of its contents. The infamous honky-tonk was boarded up from 1889 to 1934, thereby preserving everything. Tombstone is located on AZ-80 about 20 miles south of I-10. Visit time: one day. Tombstone Chamber of Commerce - Listing of attractions, accommodations, restaurants, shopping, and calendar of events. 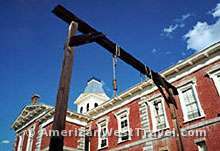 Tombstone, Arizona (Wikipedia) - Historical information, demographics, geography and geology. When the gold and silver gave out in Tombstone, the nearby city of Bisbee became the center of activity with its immense Copper Queen Lode. Besides copper, the mines of Bisbee produced gold, lead, silver, and zinc. Most of the mines are now closed, and Bisbee has attracted numerous artists and artisians. The historic downtown area features numerous art galleries; specialty shops featuring arts and crafts, jewelry, and Western items; popular restaurants; bed and breakfasts and more. Bisbee's history can be seen at several museums, viewing the famous Lavender Pit mine (right), or by touring the historic Queen Mine. Bisbee is located on AZ-80 about 30 miles south of Tombstone. Visit time: a few hours. Queen Mine Tours - Don mining lanterns, hats and slickers and ride the mine train deep into the mine. Tours leave from the Queen Mine Tour Building located immediately south of Old Bisbee's business district. Tours are available 5 times a day, 7 days a week and last about one hour and fifteen minutes. Reservations are suggested. Bisbee Mining & Historical Museum - Located in the building that served as the corporate headquarters of the Copper Queen Consolidated Mining Company, the museum provides local history and the culture of Bisbee's storied past (1877-1975). Discover Bisbee, Arizona Visitor Center - Listing of attractions, accommodations, restaurants, shopping, and calendar of events. Kartchner Caverns State Park, opened in 1999, is one of Arizona's newest wonders. Kartchner Caverns is a stunning limestone cave system considered one of the top ten in the world. 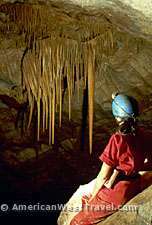 Discovered in 1974 and not revealed until 1988, the opportunity existed to preserve the caverns in near pristine condition. Kartchner is a living limestone cave. An adequate supply of ground water percolates through the limestone, leaching out calcium carbonate. It is then redeposited into all manner of exquisite formations. The calcium carbonate formations, glistening with water, resemble marble. Kartchner Caverns is extremely fragile and therefore accessible by guided tour only. The Rotunda and Throne room tours run all year round. The tour of the immense Big Room runs mid-October to mid-April. It is closed the remainder of the year when the room is occupied by nursing bats. The popular tours often sell out, especially during the cooler months. Ticket reservations are recommended. Call (520) 586-CAVE or visit the Kartchner Caverns State Park's web site (see below). Fort Bowie was the center of military operations during thirty years of conflict with the Chiricahua Apaches. The war culminated with the surrender of Geronimo in 1886 and the banishment of the Chiricahuas to Florida and Alabama. This remote historic site features a visitor center, picnic area, and the ruins of the fort. The round trip hike from the parking area to the ruins is three miles. Along this quiet trail, visitors will get a sense of the lonely isolation that the soldiers experienced while stationed here. From Willcox on I-10, take AZ-186 to the Fort Bowie turnoff, then drive eight miles on an unpaved road. Time: allow 2-3 hours if you hike the trail. Coronado National Memorial is a National Park unit that commemorates the Francisco Vasquez de Coronado Expedition of 1540-1542 which explored the land north of Mexico. The Memorial does not protect any tangible artifacts related to the expedition. The location was chosen for the panoramic views of the US-Mexico border and the San Pedro River Valley, the route believed to have been taken by Coronado. There are several good hiking trails with excellent vistas. Visitors can explore Coronado Cave on their own after getting a permit. There are also good scenic drives as well as graded backcountry roads headed west into Coronado National Forest. Located off of AZ-92. Equal distance from Bisbee or Sierra Vista. Time: Several hours to take a hike or explore the cave. Off the beaten path. Chiricahua National Monument preserves the unique northwest corner of the Chiricahua Mountains in southeastern Arizona. This region was known to the Apaches as the Land of Standing-Up Rocks; the pioneers called it the Wonderland of Rocks. Much of the monument is a maze of rock spires, hoo-doos, giant rock columns, and delicate balanced rocks. A network of trails accesses these badlands and offer fascinating hiking. The most unusual trail loops through the Heart of Rocks, a huge badland of fanciful rock formations. The trail cuts through in almost maze-like fashion, taking convoluted twists and turns through narrow slots and openings in the rocks. This unspoiled, remote area is also very rich in wildlife. Great photo oppotunities. Highly recommended for those who can do a moderately strenuous hike. Located southeast of Willcox off of AZ-186. Time: A full day to do a loop hike. The remoteness probably requires an overnight stay. In the 1860's, the charismatic Chiricahua Apache leader, Cochise, adopted the rugged canyons that cross the midsection of the Dragoon Mountains as a refuge for himself and his people. This natural fortress came to be known as Cochise Stronghold. The outlandish rock formations and thick oak-juniper vegetation offered a concealed escape route either east or west out of the mountains. The rugged 4.5 mile Cochise Trail gives visitors some idea why Cochise considered it a stronghold. There is also a shaded campground in a magnificent, rugged canyon. Location: From Tucson, take I-10 east 72 miles to US 191. Turn right (south) and drive 12 miles south to Ironwood Road. Turn right and drive 8 miles to Cochise Stronghold Campground. Time: Very remote location, expect to stay overnight. Cochise Stronghold Campground (National Forest Service) - This campground is located in a magnificent, rugged canyon that served the famous Apache Indian leader, Cochise, as a refuge. Campsites at Cochise Stronghold are shaded by oaks and surrounded by a diverse community of vegetation that includes plants of both the Upper Sonoran and Chihuahuan Desert. Elevation: 5,000 feet. 12 Individual campsites, 2 group campsites. Trailers limited to 22 feet. Limit 2 vehicles and 10 persons per site. No hookups. Note: Black bears in area. The towns of Nogales, Mexico and Nogales, Arizona are adjacent on the Mexico/U.S. border. It has long been a popular place for visitors to walk across the border to Nogales, Mexico, in order to experience a day trip into Mexico without the hassle of bringing a car across. Nogales, Mexico, offers good restaurants and a wide variety of shopping opportunities, especially in crafts. For the latest entry requirements, visit the Embassy of Mexico’s website or contact the Embassy of Mexico at 1911 Pennsylvania Avenue NW, Washington, DC 20006, telephone (202) 736-1600, or any Mexican consulate in the United States for the most current information. The Western Hemisphere Travel Initiative (U.S. Customs and Border Protection) - U.S. and Canadian travelers are required to present a passport or other document that denotes identity and citizenship when entering the U.S.
Few people are aware that Arizona has a "wine country" or vineyards. Actually, there are about twenty wineries in the state, most of them tiny, family ventures. However there are excellent wines to be found, and in gorgeous rustic settings featuring tiny villages and lonely range country. The heart of Arizona wine country is around the tiny villages of Elgin and Sonoita, both about an hour south of Tucson. Outstanding winemaker, Kent Callaghan, produces superb premium wines on 17 acres at Callaghan Vineyards. 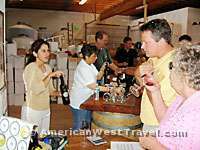 Sonoita Vineyards, the original Arizona winery, produces several lovely festivals each year as well as some very excellent wine. Other wineries in the area include Village of Elgin, and newcomers Dos Cabezos and Rancho Rossa. Elgin and Sonoita offer beautiful rural Arizona experiences. There are bed and breakfasts and restaurants in the area. Located near the intersection of AZ-82 and AZ-83. Inquire locally for directions or follow signs. The Sulphur Springs Valley runs north and south of Willcox, Arizona. This fertile valley produces a bounty of fresh fruits and vegetables with a host of farms offering their wares directly to the public during the growing season, mid-summer to early fall. Some farms specialize in organic produce. Many offer the "U-Pick" option where you can pick your own vine or tree ripe produce at a reduced price. 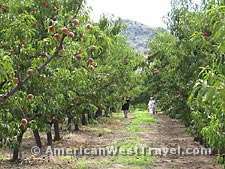 Due to the valley's relatively high elevation, fruit trees, particularly apples and peaches, are especially abundant. The most well-known farm is Apple Annie's which actually consists of a fruit orchard at one location and a vegetable farm at a second location a few miles away. The orchard offers numerous festivals and craft fairs during the summer, pertaining mainly to apples and peaches. You can purchase peach pancake breakfasts or burgers grilled on applewood for lunch. Their bakery sells fresh-fruit pies and other treats. Stop at their vegetable farm for fresh-picked corn. A great place to spend half a day.